Leading distributors of welding equipment, consumables and associated welding technology, SMENCO offers a new range of CNC profile cutters designed and built in Australia by a small Melbourne metal manufacturer. Recently launched by partners, welding engineer Michael Reitel and software specialist, Ian Christiansen, the competitively priced MiCut CNC oxy plasma cutters are produced at their Melbourne engineering facility using several parts sourced locally and employing modern innovative manufacturing methods. According to Michael Reitel, the MiCut profile cutting machine range has unmatched accuracy and robustness in its class. Easy to install, operate and maintain, the plasma CNC cutters deliver ongoing reliability, speed, accuracy and long life. 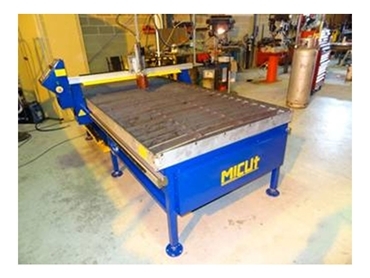 The MiCut CNC profile cutters come in a choice of two models: The 1212 with a cutting area of 1230mm x 1230mm and the 1224 with a cutting area of 1230mm x 2460mm. MiCut’s unique backlash gear technology and high quality precision tool steel gear racks with ground gears deliver superior accuracy matched to precision tool steel gear racks and a patent anti-backlash drive system design.